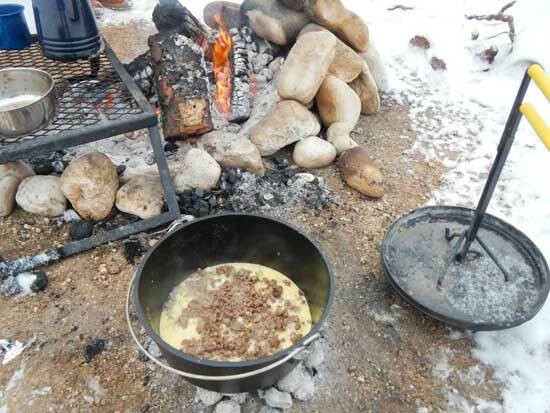 Mountain Man Breakfast is an old classic that’s been done on multiple other websites, but I feel the need to re-hash it here because its super easy to make and its one of my favorite breakfasts to cook at the campfire when I have my cast iron dutch oven with me. The benefit to the recipe is that it’s easy to scale up or down depending on how many people you have with you. 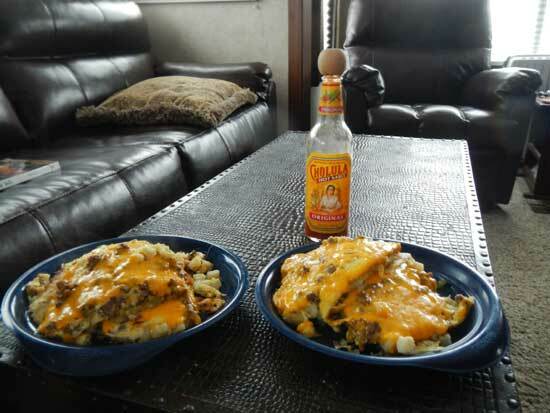 Its also super tasty when you have a bottle of Cholula Hot Sauce with you. 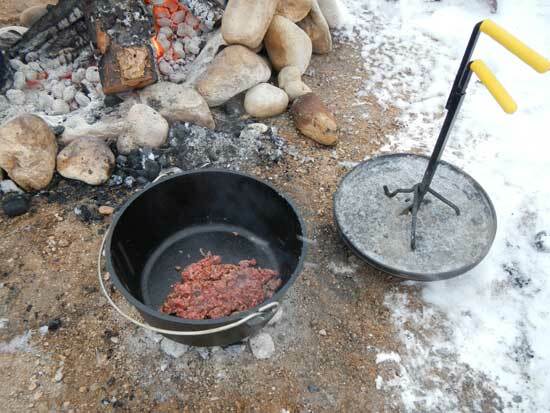 First, make sure that you’ve properly seasoned your dutch oven. The potatoes and onions will just stick to the bottom and make a big burnt mess otherwise. 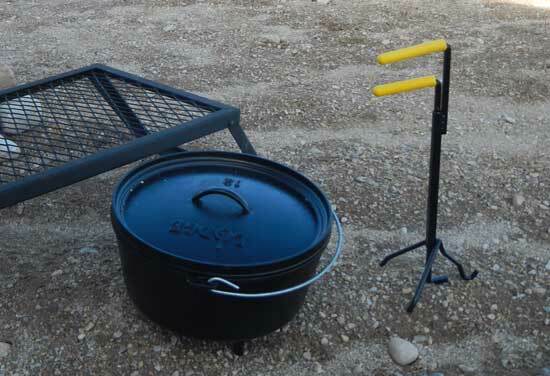 I always recommend using regular charcoal when using your dutch oven so you can control the temperature a little better. I usually just put some on the edge of the campfire to light and scoop them out with a little shovel as I need em. The most efficient way is to use a charcoal chimney starter . 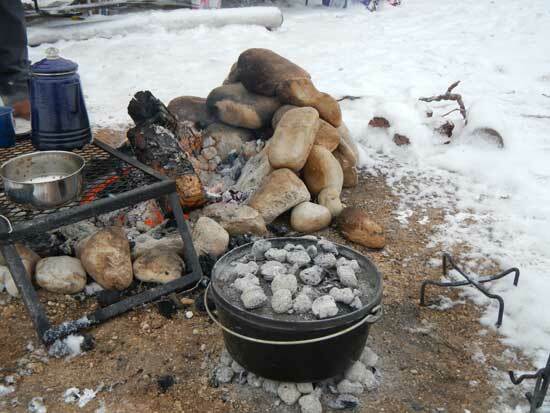 The amount of charcoal you’ll need varies depending on how cold and how windy it is outside. You’re going to want to cook this fairly hot, so 12 briquettes underneath and 18 on top, spaced evenly, should work. Next, brown the pork sausage, making sure you break it up well with the spatula. Once its thoroughly cooked, take it out with your spatula, put it in a bowl and set it to the side. 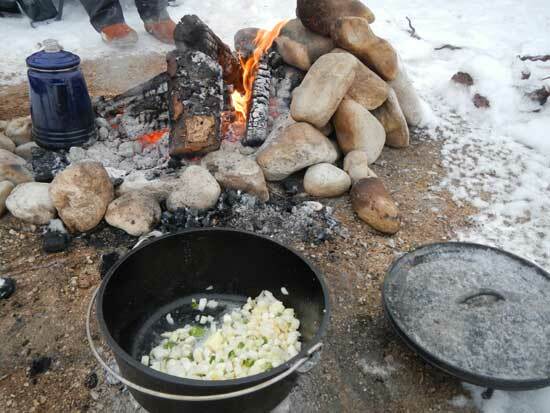 Now, leaving the oil from the sausage in the dutch oven, throw your butter, potatoes, onions and jalapeno in and cook until browned. Spread the browned sausage on top of the potatoes, don’t mix it up. Beat the eggs with your salt and pepper and pour evenly over the top of the sausage and potatoes. Then, sprinkle your shredded cheese over the top of that. Cover with your lid, put your briquettes on top and bake for about 20-30 minutes until the eggs are firm. 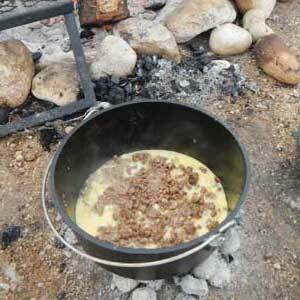 To get it out of the dutch oven, cut it like a pie and spoon it out with your spatula. I prefer to douse it with Cholula hot sauce, but salsa or Tabasco will work too. I understand that with those ingredients its not that healthy, but you’re about to hike ten miles, you’ll burn it off.